There have been a lot of innovations in payment technologies over the last few years. We can send money using apps and via email, and many Android phones even have NFC wallets built-in. Impressive though that may all be, though, none of it really trumps the simple magnetic strip credit cards we’ve used most our adult lives. That may be about to change thanks to a new startup called Coin. It’s making a lot of waves on the Internet with an innovative concept: Instead of carrying around a wallet full of credit cards, you carry around a single Coin card. Shaped identically to a traditional credit card, the Coin device features a small button capable of changing card’s identity. Want to use your Visa? Press a button until “Visa” appears on the Coin’s included digital screen. Looking for your supermarket club card? Again, press the button until that data is selected. Coin will alter its own magnetic stripe data, becoming whatever you need it to be at that moment. And best of all, it does all this without requiring constant recharging: Coin lasts for 2 years of average use before needing a battery refresh. Though Coin will carry more data than a single credit card, it actually may wind up being a much more secure option. That’s because Coin syncs with your smartphone through low-energy Bluetooth and its own app. If the two are separated for a period of time (that you can choose), your Coin will automatically deactivate itself. Your smartphone can even give you a warning when that happens, cluing you in pretty quickly when you accidentally leave your card behind at the coffee shop. That’s not the end to Coin’s security features, either. To add your existing credit cards to Coin, you’ll need to take a picture of it using your phone, enter the account details into the free Coin app and then swipe it using an included card reader. You can only add your own cards, and only if you’re in physical possession of it. It’s hard to tell whether or not Coin will be a hit – we’ll have to see when the device officially launches next year. 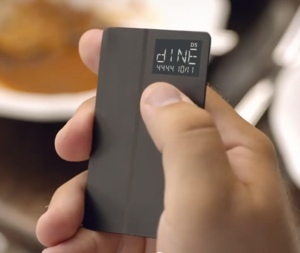 If you’d like to be an early adopter anyway, Coin is available for pre-order for $50 each; the device is slated to retail in Summer 2014 for $100. To learn more about Coin, check out the company’s website or the promotional video below.